In the 103 years since it first splashed into Lake Ontario at the foot of Sherbourne Street, Trillium, the side-wheeled paddle ferry, has had an eventful life carrying day-tripping passengers from Toronto to the city's idyllic islands, occasionally saving lives and sinking inferior boats. 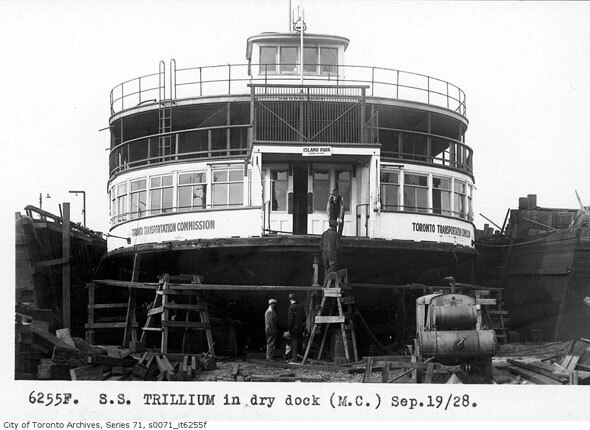 Named for the white plant that would later become the province's official flower, the Trillium's steel hull was riveted together by Polson Iron Works, the shipbuilding company responsible for many other important vessels in Toronto's history, including the Ontario 2 passenger ferry and the utterly bizarre roller boat. However, none of the shipyard's creations would have anything like the longevity of the of this particular florally named vessel. 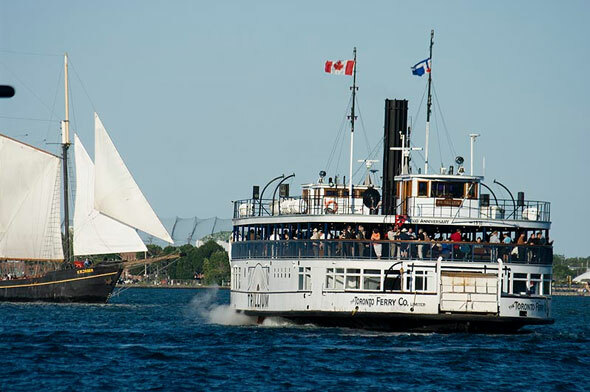 Just after noon on June 18, 1910, the Trillium, christened by the eight-year-old daughter of the president of the Toronto Ferry Company, made an ungraceful sideways entrance into the shallow water. At 150 feet long and 45 feet wide, the Trillium was a substantial vessel that would have been difficult to maneuver were it not for a special type of power assistance which the Toronto Star said allowed the vessel to be "steered by the little finger." Roughly two weeks later, its engines and wooden deck finished, the partially-painted ferry was given its first shakedown by the thousands of Dominion Day travelers that crowded to Hanlan's Point for a special one-day carnival featuring Mike the Bucking Mule ("more fun than an army of clowns! "), a dog and pony circus, and a thrilling Viennese high-wire unicycle act, the DePhil Brothers. 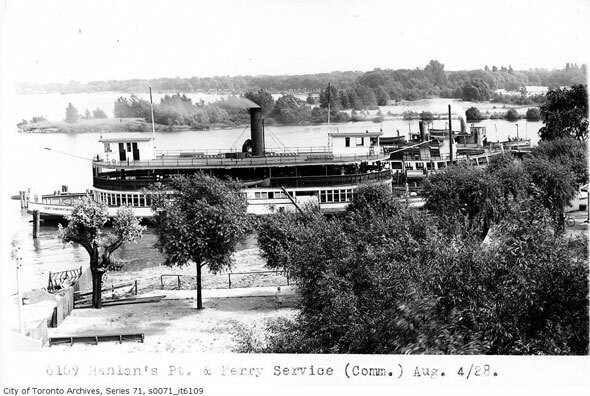 With its sister ferry "Bluebell," the Trillium worked the short hop between the city and the Hanlan's Point amusements while larger lake-going vessels brought revelers from Buffalo and Niagara to see the two baseball games that were scheduled that day. Later that summer, the side-wheeler was pressed into service during a fire at the foot of Scott Street, then a waterfront address, that threatened to destroy several wooden boat sheds and a pier. From a position on top of the boat, Toronto Ferry Co. manager Lawrence "Lol" Solman doused the roaring flames with a pressurized hose. A second fire boat, the Nellie Bly, presumably named after the American journalist famous for her round-the-world trip and exposĂŠ piece of US mental health practices, was also involved. "Their combined efforts prevented the fire from spreading," noted the Star. A year later, manager Solman was involved in more heroics aboard the Trillium. A canoeist making a late-night crossing of the harbour had discovered a floundering young couple whose sail boat had capsized. Hauling the exhausted pair aboard his tiny ship, the man risked sinking his own craft and his own personal safety. The canoeist hailed the passing Trillium, and Solman, on board once again, helped the trio aboard using the ferry's life raft. Strangely, all three of those rescued refused to give their names. "I would certainly like to know his name," said Solman of the mystery paddler, who disappeared into the night shortly after. "If there are any medals going for brave acts he certainly deserves one." Solman (pictured above) had a close connection to the Toronto Islands and Hanlan's Point in particular. He was the son-in-law of John Hanlan, the hotelier for whom the area is named, and brother-in-law of Ned Hanlan, the world-champion rower and alderman. 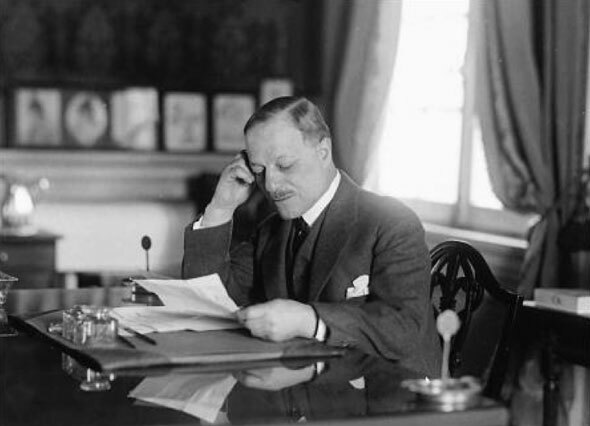 His business interests in the area included ownership of the Toronto Maple Leafs baseball team and managing director positions at Hanlan's Point Hotel and Amusement Park, to name a few. His own company, Toronto Ferry Co., held a monopoly on passenger traffic to and from the Islands until it was absorbed by the TTC in the 1920s. Despite his dominance, Solman's actions suggest a kind heart. During a blistering heatwave in the summer of 1921, he offered the Trillium and a bottomless supply of cold milk to the mothers and children of the city so that they might enjoy the cool off-shore breezes. The TTC took over ferry operations from the city in 1927, bringing the Trillium and its sister ships the Bluebell, Mayflower, Primrose, Jasmine, John Hanlan, Clark Bros., and Luella into the company that operated busses and streetcars in the city. The Trillium began to lose its way when Lawrence Solman died in 1931. Over the next two decades the vessel continued to make the trip from the foot of Bay Street to Hanlan's Point but was slowly becoming surplus to the TTC's requirements. It, along with the Bluebell, was purchased for $4,500 by the Metro Toronto Works Department who planned to strip both for use as garbage floats. As historian Mike Filey notes in his excellent book about the Trillium, available in part via Google Books, a timely intervention halted work on both ships but not before the Bluebell had been gutted. Both were towed to a lagoon at the Toronto Islands and left to rust and capsize instead. Almost twenty years in the water without maintenance took its toll on the Trillium. When Filey and others at the Toronto Historical Board persuaded Metro Council to pay $95,000 to restore the ferry in 1973, the boat hadn't moved in 16 years, causing much of the woodwork to be unusable. The Bluebell wasn't as lucky - it was towed to the tip of the Leslie Street Spit and discarded. 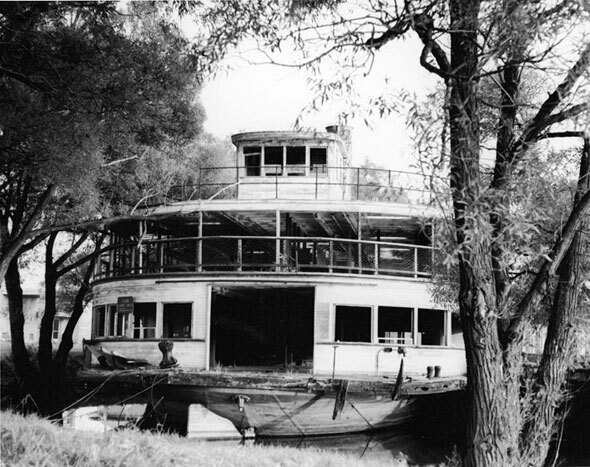 The newly-fixed ferry re-entered service in November 1975 under the control of Metro Toronto Parks and Culture. The TTC exited the boat business in 1961, shortly after the Trillium was abandoned to focus on its subway and surface transit operations. The last of the Trillium's famous acts arrived with a crunch in 1981 when a sudden mechanical failure on approach to the ferry terminal prevented the vessel slowing as it approached the dock. Out of control, the Trillium's momentum carried it west into the side of the packed MS Normac, then the home of Captain John's restaurant. "The lights went out and there were sparks flying and I thought it has to be a bomb," Bill Bolton breathlessly told the Toronto Star that night. 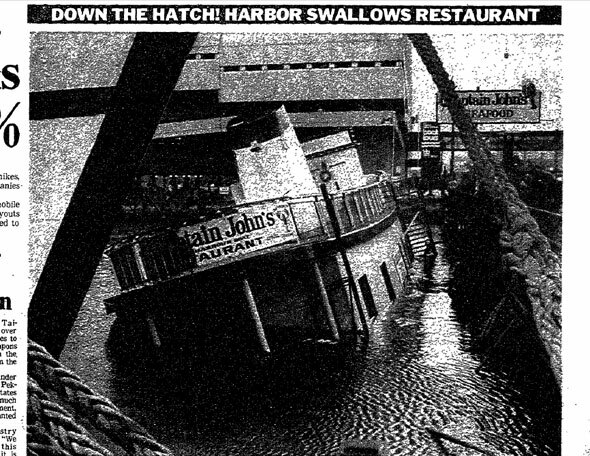 "The whole ship rocked when she crashed," recalled Gary Farbish, a honeymooning Florida resident enjoying a meal with his wife. "It knocked the dishes and everything off the table." Luckily, the accident only caused minor injuries. The Normac, however, developed a slow leak and capsized at its permanent mooring two weeks later. John Letnik would later sub in the Jadran, the Normac's neighbour on the Yonge Street slip, to take over the restaurant business until its closure this year over unpaid bills. The Normac now resides in Port Dalhousie, Ontario. With the hardiness of its namesake, the Trillium, not for the first time in its history, was patched up and put back into regular service where it has remained ever since. On your next trip to Hanlan's Point be sure to take a moment to appreciate Toronto's oldest working public vehicle. It could easily have wound up on garbage duty. Photos: City of Toronto Archives, public domain, Toronto Star; June 17, 1981, P1, and Stephen Gardiner from the blogTO Flickr pool.